That section, which protected the democratic rights of the Arab Palestinian minority, and should have ensured full and equal human rights for all residents of Israel has been ignored. The allocation of land, specifically municipal zoning regulations, is one major way this difference is displayed. The Arab Association for Human Rights is headquartered in Nazareth, specifically the Mary’s Well District. A twenty-minute walk north from Mary’s Well will take you to al-Safafri, a poor, predominantly Muslim neighborhood. Al-Safafri is about 60 years old and that is not a coincidence. The families living there descended from people who were forced from there homes in a town called Safuri in 1948. During the Nakba, Safuri was bombed and the residents either fled from the devastation or were transferred by the nascent Israeli state. Though the majority now live in al-Safafri, there are descendents of Safuri refugees living in the refugee camps in Lebanon. 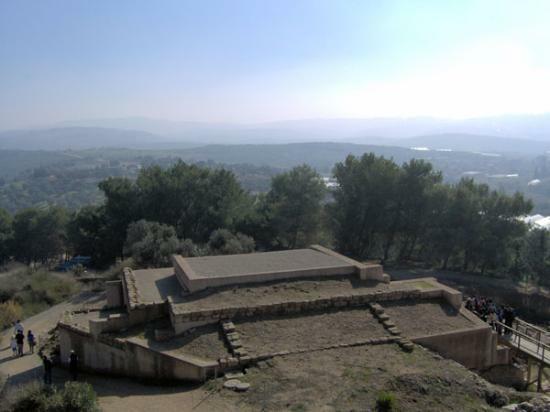 Safuri was very close to Nazareth, it would be visible to residents of al-Safafri if its buildings stood today. These people take their evening meals and gaze out their windows at land they used to own. Unfortunately, there is little physical evidence of the Arab town Safuri; itself a permutation of what was once Sepphoris, a Roman village. 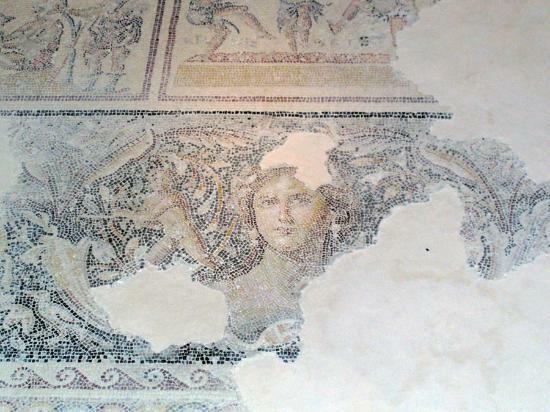 The town is gone and in its place is Zippori, an Israeli national park, home to “mosaic floors [that] bespeak the opulence of Roman Sepphoris. The relatively small Roman theater is mute evidence of the cultural life the wealth could support.” That is how Zippori is described in Fodor’s Travel Guide to Israel in which it is a “Fodor’s Choice” destination in the Lower Galilee. Needless to say, the travel guides do not mention that today’s residents of al-Safafri are legally considered “absentees” and have no right to the land their families used to own. Fodor’s recognizes Israel’s protection of the Roman mosaics and its defense of historical tradition, but both Fodor’s and Israel ignore the almost 2000 years of Arab history. Israel has denied the Palestinian Arab minority basic human rights – in this case the right to own land – since its founding, and there is no sign of change in this policy coming. Almost a third of the Arab Palestinian minority in Israel is living in a situation like this one. These people no longer reside in the traditional homes of their ancestors because of the Kafkaesque, and discriminatory, machinations of the Jewish state. This brings us back to Nazareth; in 1953 the Israeli government started a program of Judaization in the Galilee. Essentially, this campaign was to bring a “demographic balance” to the area of Israel with the highest population density of Arab Palestinians, in other words, it incentivized a massive influx of Jewish inhabitation. Yosef Weitz, an executive at the Jewish National Fund and proponent of the campaign, described the Judaization in terms of quelling “The Arab threat”. These new, Jewish, cities were planned and built on confiscated land from Arab families: Karmiel, Maalot, and Nazerat Illit. 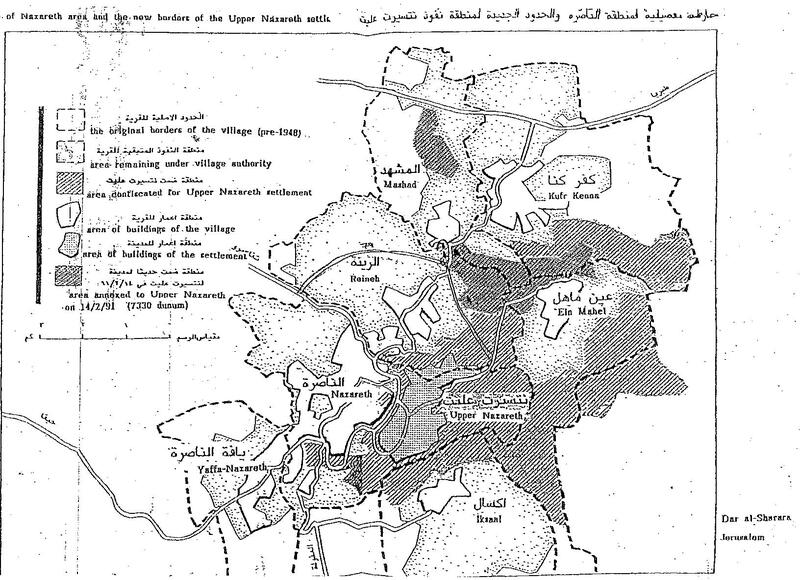 As the following map shows, Nazerat Illit covers far more ground that Nazareth, the designated Arab municipality. What the map above does not show is the population changes and the demographic history of these two municipalities. Nazerat Illit has grown as fast as the government can allocate new areas for Jewish emigrants, but Nazareth has had construction stifled. In the 49 Arab municipalities in Israel, the land that the government’s central planners designate for construction has increased 1.5% while their populations have increased by 600 times. 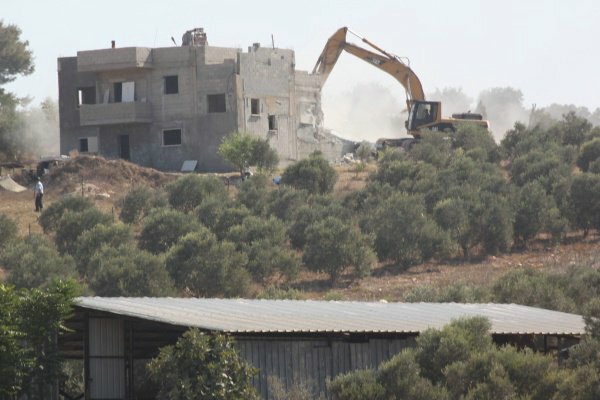 That is the pressure that the Arab Palestinian minority is under and the motive Hassan Gdir had for building his home in Bir al-Maksour without a permit. He needed the space and the government was not permitting anyone to build residences to accommodate the natural growth in population. By refusing to permit the expansion of Arab municipal zones, the Israeli government has forced the hands of men like Hassan Gdir and reneged on the promise of “full and equal citizenship and due representation”for the Arab Palestinian minority. Additionally, the devolution of Safuri village into the al-Safafri neighborhood of Nazareth and Zippori National Park indicates that this discrimination has been going on since the foundation of the state and, as long as the dual Jewish and democratic definition of Israel hold equal status, it will continue into the future. So, in response to the section of the Declaration of Independence quoted above, if the Arab Palestinian minority is to “return to the ways of peace and play their part”, where can they live? Paul Karolyi is the current intern of the Arab Association for Human Rights. 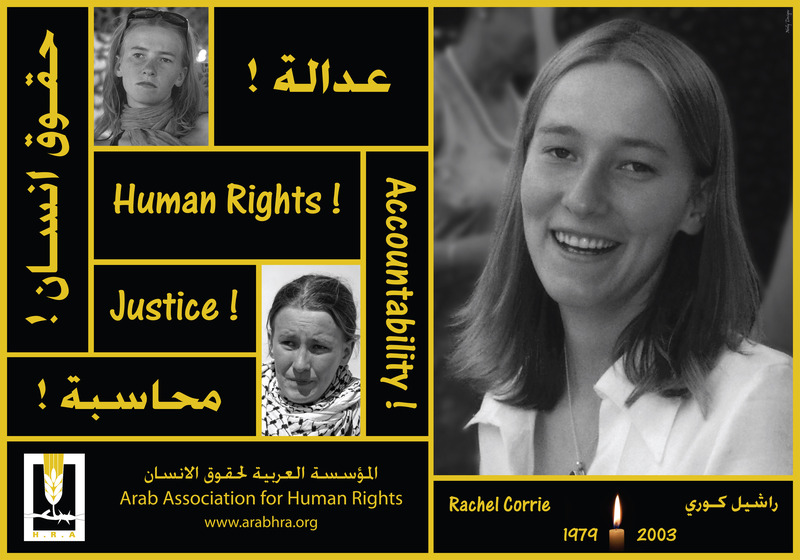 Nazareth – The Arab Association for Human Rights (HRA) held an event last Friday night to recognize Rachel Corrie and her family. It was an evening of stirring speeches and emotional tributes to the Corrie family’s ongoing struggle. Last month in a Haifa district court, Judge Oded Gershon denied the Corrie family’s most recent call for justice when, in his verdict, he decided Rachel Corrie was responsible for her own death. This decision is the most recent event in the ongoing court case over Rachel Corrie’s death at the hands of the Israeli military in Gaza in 2003. Many advocacy groups, including the HRA, have denounced this ruling with a common complaint that it reinforces the “culture of impunity” for discriminatory Israeli institutions and practices. Later, the HRA sponsored an evening program of distinguished speakers for a supportive crowd. The program began with a heartwarming video of a young Rachel Corrie dipping her toes into the pool of international progressive issues and advocating for public health and the safety of the world’s children. Another video showed an interview Rachel Corrie gave two days before her death. In it she describes the devastation in Gaza caused by the Israeli occupation and displays compassion for the Gazans she had come to know. Following the short videos a series of speakers recognized both the Corrie Family and Rachel’s dedication. Such prominent community leaders as Mohammad Zeidan, head of the High Follow-Up Committee, the head of the Northern District Committee of the Israel Bar Association, Khalid Zoabi, and Ibtissam Mualem, chairperson of the HRA took turns speaking. Hussein Abu Hussein, the Corrie family’s lawyer and a board member of the HRA, described litigation process and the prospects of an appeal. A feeling of solidarity pervaded the speeches and there was a consistent sense of communal support for both the Corrie family and the cause they have, through their diligent pursuit of justice, come to symbolize. The HRA was honored to welcome them to Nazareth and will continue to support them personally and through their appeal in the Israeli justice system. Nazareth – This past week the Arab Association for Human Rights (HRA) sent letters to the members of European Parliament on the INTA Committee, which is set to vote September 18 on the EU-Israel Agreement on Conformity Assessment and Acceptance of Industrial Products (ACAA). The INTA Committee will vote on the future of a new protocol that would accelerate trade relations between Israel and the EU. 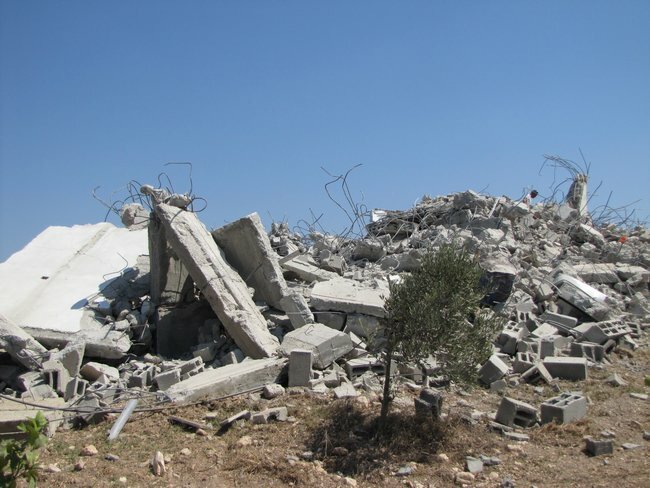 The HRA, along with our colleagues in the Euro-Med Human Rights Network (EMHRN), advocate the suspension of assent procedure until Israel complies with several human rights law and international humanitarian law standards. The Treaty of the European stipulates concern for human rights standards in consideration of any trade agreements, so this advocacy has solid legal precedent. Furthermore, a vote in assent to new ACAA protocol would amount to an acceptance of Israel violations of human rights in its own territory and in the Occupied Palestinian Territories (OPT). The HRA encouraged the MEPs on the INTA Committee to vote for a suspension in order to send a clear message that the status quo in the OPT and the status of the Palestinian Arab minority in Israel is unsustainable. 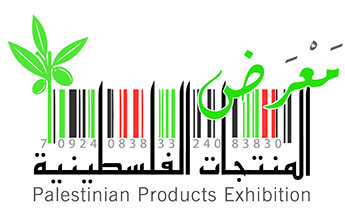 This past weekend, from August 31 to September 2, the Souq and Nazerat Illit’s megamalls had some extra competition for business because the Palestinian Products Exhibition was in town. The Exhibition was held in the Mary’s Well district of Nazareth in the same building as the Golden Crown Hotel. 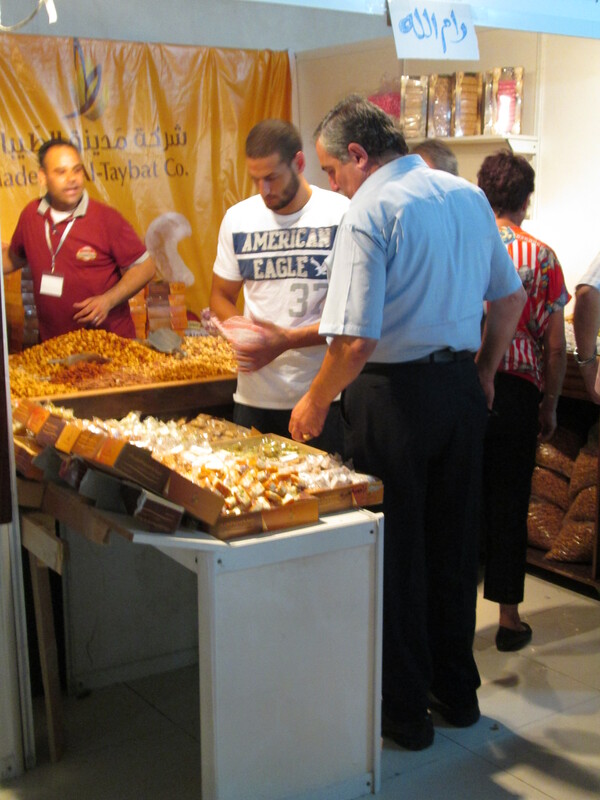 Over 40 Palestinian-owned and operated companies came to display their wares for the Nazareth business community, but also directly to consumers. 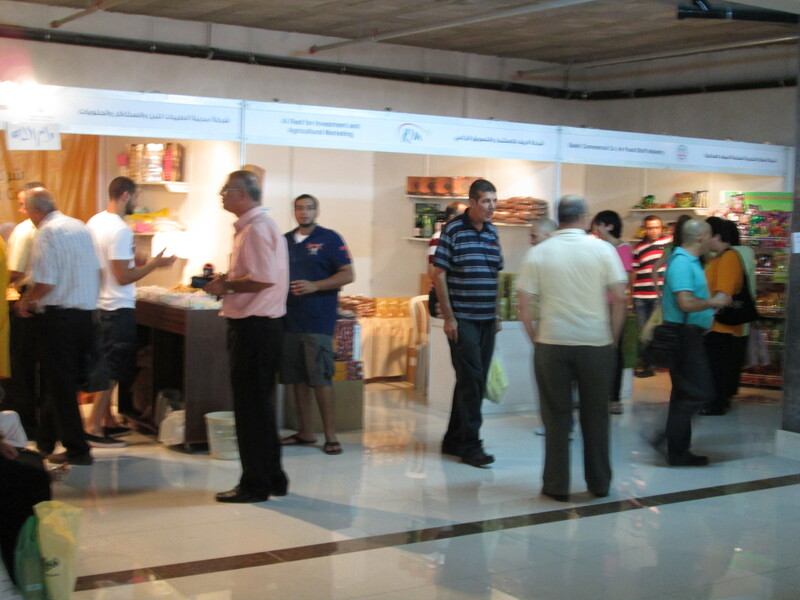 Many sectors of Palestinian industry were represented. There was a chocolate company, soap makers, candy wholesalers, furniture sellers, and even a brewery. I wandered through the lobby of the Golden Crown on Monday morning. It was a little before noon and I was hoping to avoid the heaviest hours of foot traffic, but even at that hour, when the bright desert sun was blaring down from its peak, the booths were busy. Before exploring the two full floors of booths and stalls, I took the opportunity to check out the Exhibition’s promotional materials. It was no surprise that this ostensibly commercial enterprise had a political undertone. Each company represented was allotted two pages in hefty booklet. On which they were profiled briefly, gave contact information, and gave the motive for their participation in Exhibition. To my eyes, the sight of the Golden Crown lobby filled with bustling crowds of local business owners and consumers made motives apparent, and many of the businesses did indeed describe their presence as an effort to simply “open new markets”. 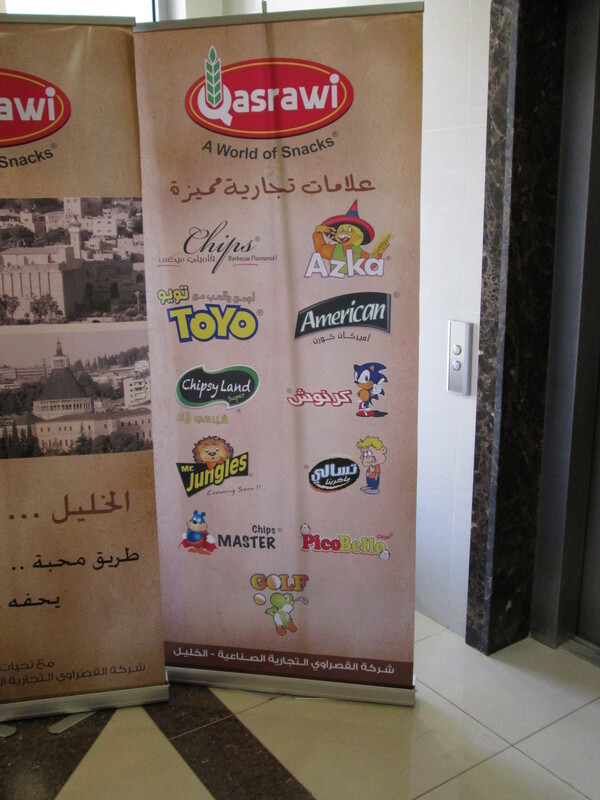 However, some of these companies see some sort of secondary Palestinian nationalist ambition to their participation. One company in particular, New Farm Company for Marketing and Agriculture, described their objective as “to market the company’s products in the occupied Palestine 1948.” Describing the Arab Palestinian minority in Israel as “occupied” is an interesting choice for a company looking to build business relations in Israel and turn a profit given how controversial some Israeli would see that claim. But, their boldness expresses the condition of the Palestinians in Israel and no one reading these promotional materials is going to be offended. Palestinian business can define themselves in solidarity with the Palestinian minority in Israel because of the intense separation between Jewish Israeli and Palestinian Arab communities. New Farm is not going to lose business. New Farm is not alone in defining their commercial enterprise in terms of Palestinian solidarity. Many other businesses in attendance described their regional goals with reference to “the green line” and “’48 territories”. Another attendee, Emirates Delights Company, was motivated to participate by a desire to “enhance the company’s name and display its various luxury products for the Palestinian consumer inside the Green Line.” Though others alluded to this fact, the premise was clear; these companies from Gaza and the West Bank were producing and marketing goods for primarily Palestinian consumers, be they in Israel or the Occupied Territories. 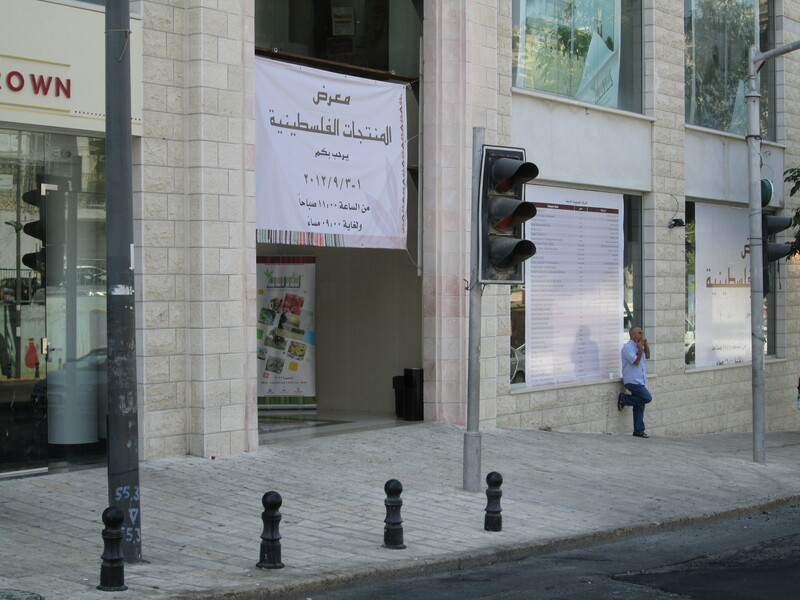 Even a simple exhibition of consumer products takes on a political purpose in Nazareth; for this one, it was an exhibition not only of Palestinian products, but also of Palestinian nationalism. Walking past the Golden Crown Hotel, it was impossible to miss the myriad banners and signs advertising the Exhibition. They did a great job marketing online too. The Exhibition was sponsored by PalTrade, The Peres Center for Peace, the Nazareth and Galilee Chamber of Commerce, and the Norwegian Ministry of Foreign Affairs. It was surprising to me, but Norway is very active in Palestinian development. Free sample, sir? Yes, please! I did a double take on this one too. 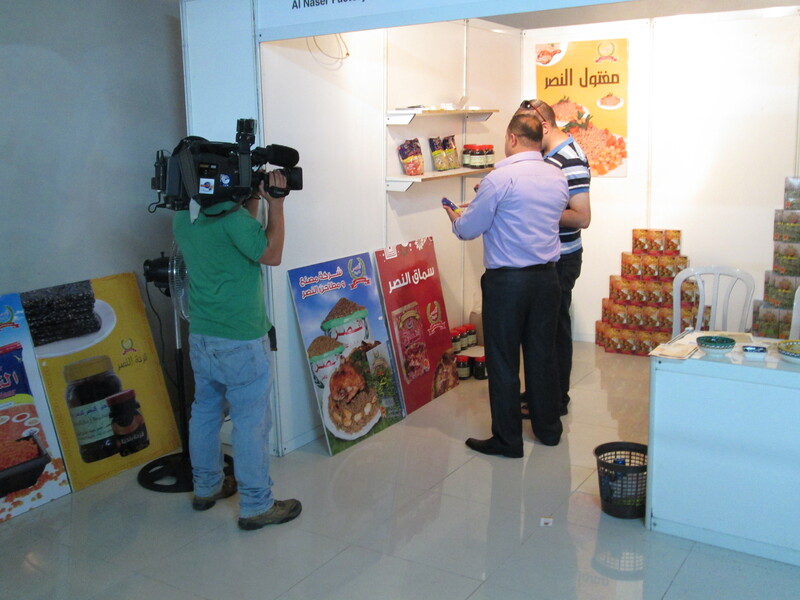 Your eyes are not deceiving you, that is Sonic the Hedgehog being used to sell Palestinian snacks. “These cheese puffs are so edgy and cool!” Can you spot the other classic video game icon in this advertisement? This is a real salesman at work. Easing the customer in to the purchase with pure positivity; this man walked out of the Exhibition with two big bags of nuts and I’m sure he felt like a champion. Paul Karolyi the current intern at the Arab Association for Human Rights. This article originally appeared in Haaretz on 9/2/2012. It can be viewed here. This article was posted originally on Electronic Intifada on 8/31/2012. It can be viewed here.